Wall to ceiling windows, textural delights where fur and wood meets leather and wool and a riot of pattern and colour…that’s what you will discover at The Refinery – New Street Square! Your feast at this restaurant bar starts visually with its tasteful decor and uber cool vibe which is the very definition of “relaxed chic”. After breathing in the amazing atmosphere, it was time to get our actual feast on, as we were starving and one perusal of the menu had us instantly hungry to try the delicious fare on offer! Seriously, it was a hard task choosing but the insightful and exceedingly cheerful help of our lovely waitress helped us narrow down our options. To start, I chose Broad Bean & Ricotta on Toast, as I fancied something fresh and light on that hot summer’s day, whilst Nicky opted for the Crispy Squid with Lemon Mayonnaise. And in true “ladies that lunch” style, of course we had to opt for cocktails whilst we waited. My tipple of choice? Well, it had to be the Tiki Punch – a heady concoction of Coconut-washed Pampero Rum, Banana Liqueur, Pineapple, Lime & Stout. 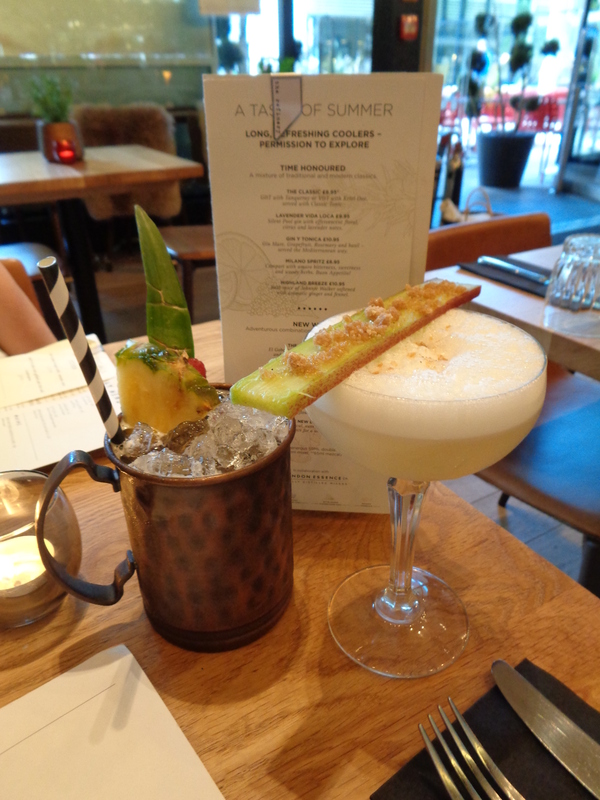 I can only describe this a sunshine in a tiki cup – deliciously sweet and refreshingly alcoholic! Nicky indulged her sweet tooth with a Candy Shop – Tanqueray Gin, Rhubarb & Custard Liqueur & Lemon, which took those childhood flavours of youth into seriously adult territory! 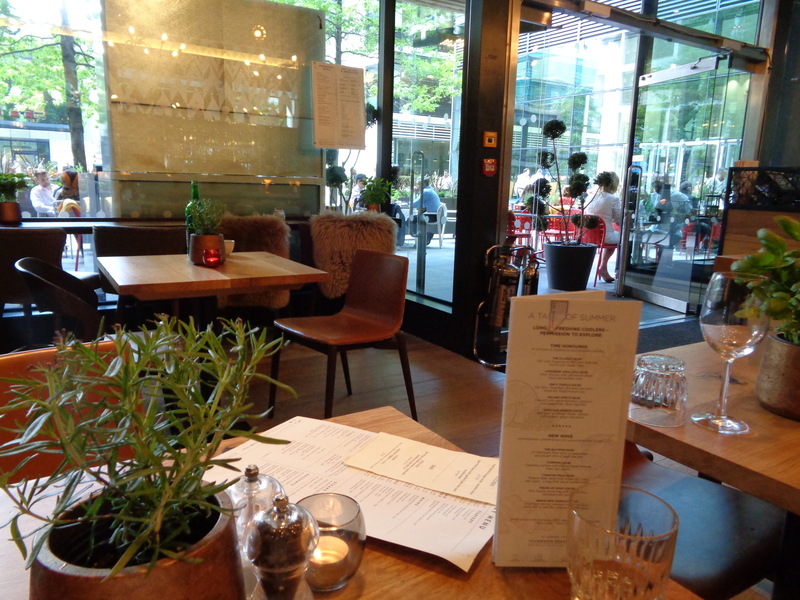 Our food arrived quickly and we were really impressed by how fresh the dishes looked and, most importantly, tasted! Seriously, it was insane how crisply clean the food was, delivering flavour that satisfied. 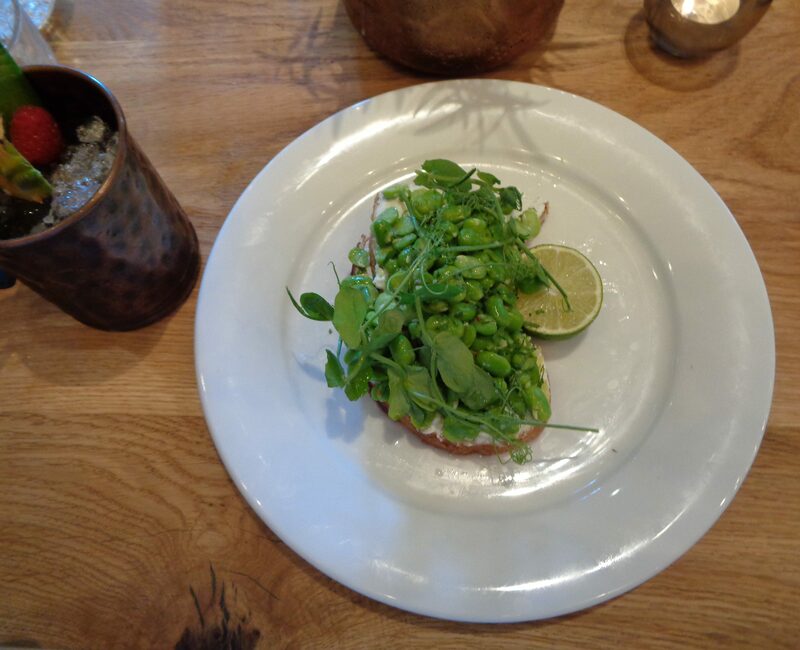 My Broad Bean & Ricotta on Sourdough Toast was rich with flavours of lemon, lime and mint, which was the perfect refreshing starter for a summer’s day. 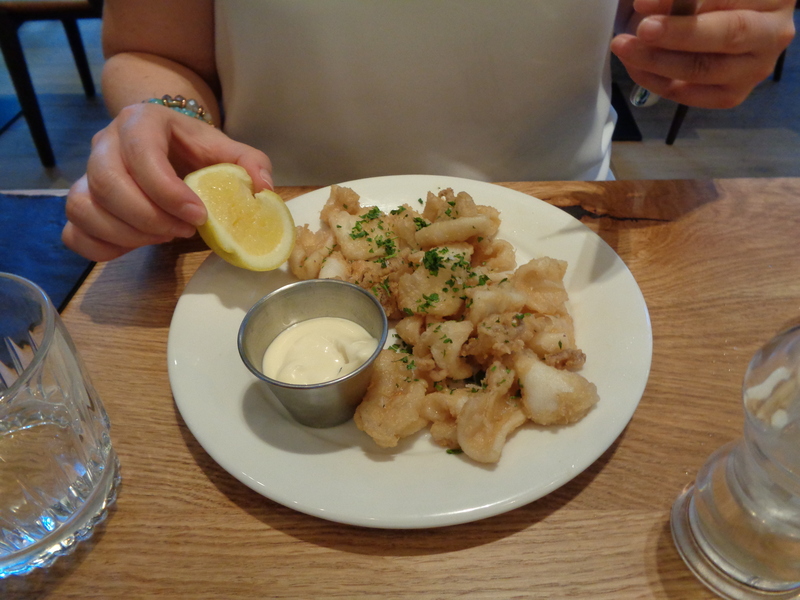 Nicky’s Squid was possibly the best we had tasted, including places which are bang on the seafront! And as you can see, the portion size was enough to be considered a main. With such impressive starters, we were excited for the main event! 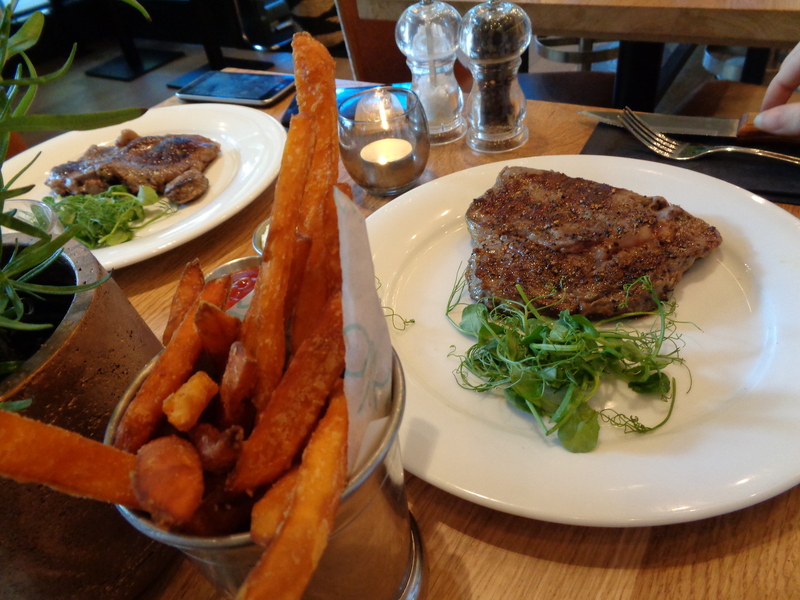 For main, we had both decided to opt for steak, but different cuts – Rib-eye for myself and Sirloin for Nicky, accompanied with our perma-fave side dish, sweet potato fries. Again, it arrived quickly and was cooked to utter perfection, with just the right amount of seasoning and a small side of peppery watercress. My Rib-eye was cooked rare and was as tender as you could possibly want with that “melt in the mouth”-ness you always strive for in a good steak. The sweet potato fries were just divine and again, a great portion size…in fact we struggled to finish, but…we did!!! And…I know I just said we were stuffed, but it would have been rude not too have indulged after our waitress’ hearty enthusiasm that “no meal was complete if you didn’t have afters”! 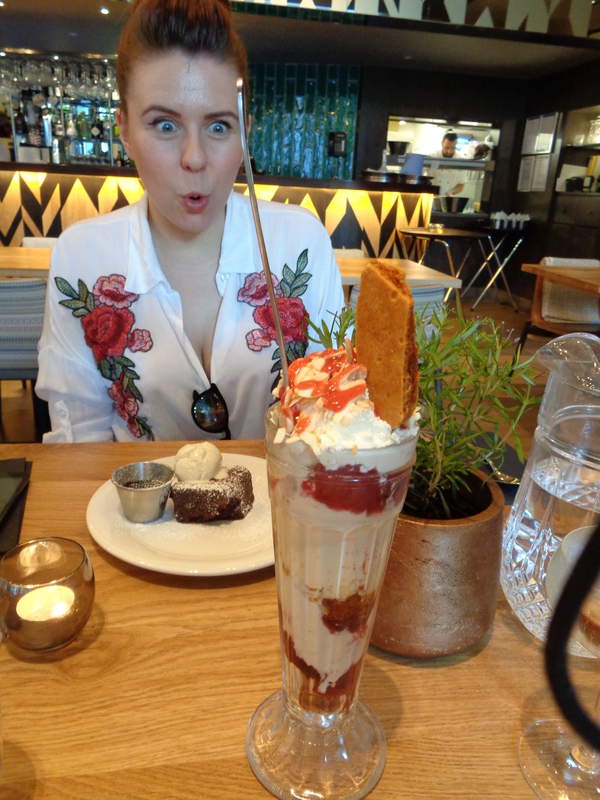 I quickly agreed after little persuasion and decided upon the Chocolate Brownie with Vanilla Ice Cream, whilst Nicky went with our waitress’ suggestion of the Knickerbocker Glory. We prepared to be K.O’ed by our choices and we were with style and bags of taste. 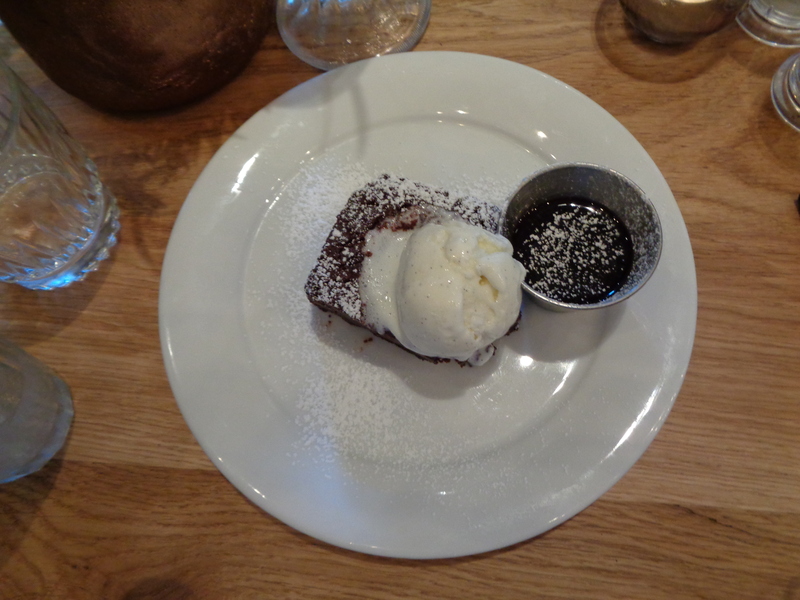 My Brownie was just everything a great Brownie should be – crisp on the outside, gooey to the point of almost being under-cooked on the inside. The Vanilla Ice Cream cut through the richness beautifully. And the showstopping bit of the dish? An extra pot of hot, melted chocolate to pour on top. But I must say, I got proper F.O.M.O when I saw Nicky’s Knickerbocker Glory! With Salted Caramel Ice Cream, Plum, Honeycomb, Cream & Almonds, it was an elevated version of the classic – sweet, sticky, yumminess! The perfect end to the perfect meal really! Escaping away to this urban oasis is definitely one we will repeat! 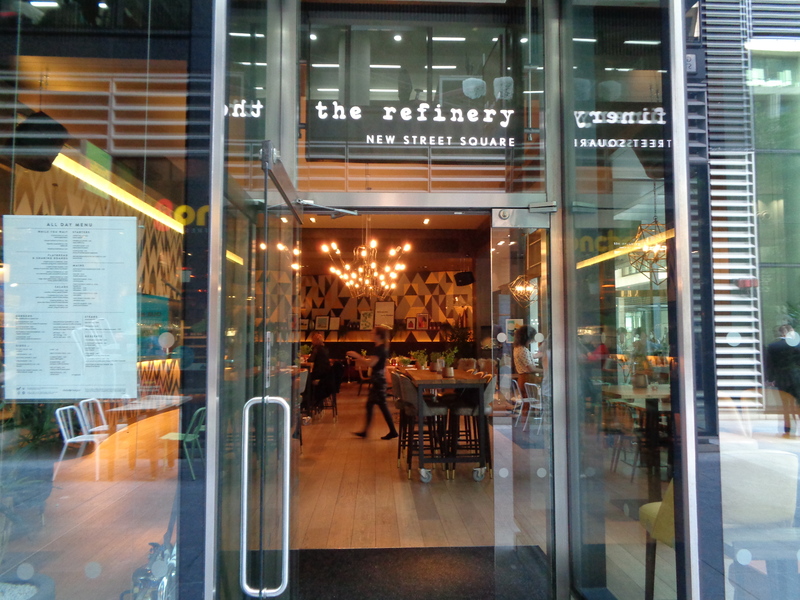 The Refinery -New Street Square is just the perfect post work hideaway to meet with friends for great cocktails to enjoy out on the fabulous terrace, grab brunch on a lazy day or to indulge in a leisurely full-blown meal over a long evening. Seriously, this is a true gem of cool calm a stone’s throw from the hustle and bustle. 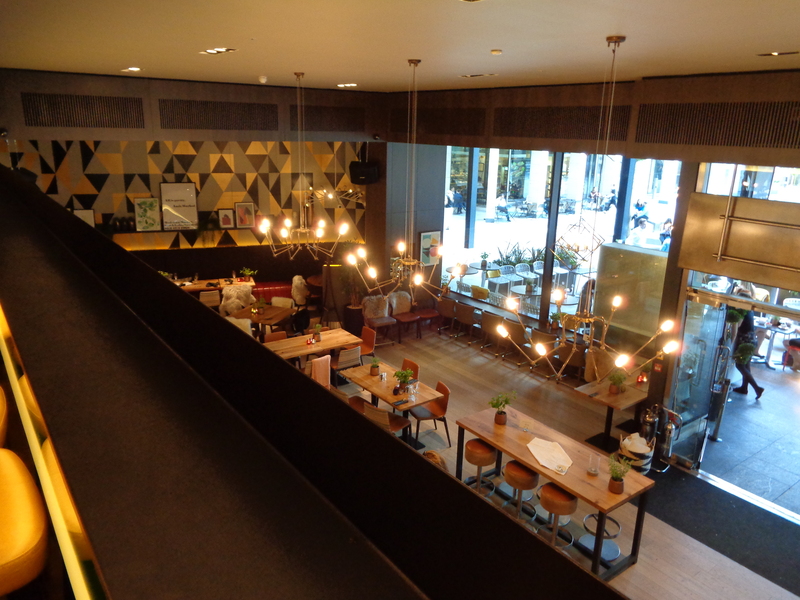 The Refinery has other venues across London, so be sure to find your nearest branch asap. We, for sure, will be back! Be sure to check out all our other Food posts right here – it’s a Foodie’s heaven! P.S. Want all the latest fantastic foodie treats from FDJ LDN straight to your inbox? Well, why not join our mailing list? Click the “Subscribe” button at the top right of the page and – DING! You’ll get all our posts as soon as they are published straight to your Inbox. You can also follow us on Bloglovin’ if you like. And be sure to check us out on social media! Follow us on Twitter, Instagram and Facebook. Looks like a fancy place! I’m a huge fan of steaks, especially your choice, the rib-eye! Definitely looks like an oasis! Those desserts were to die for! The food and cocktails look amazing. Will have to check it out next time I’m on this side of town. Your face at dessert though lol! 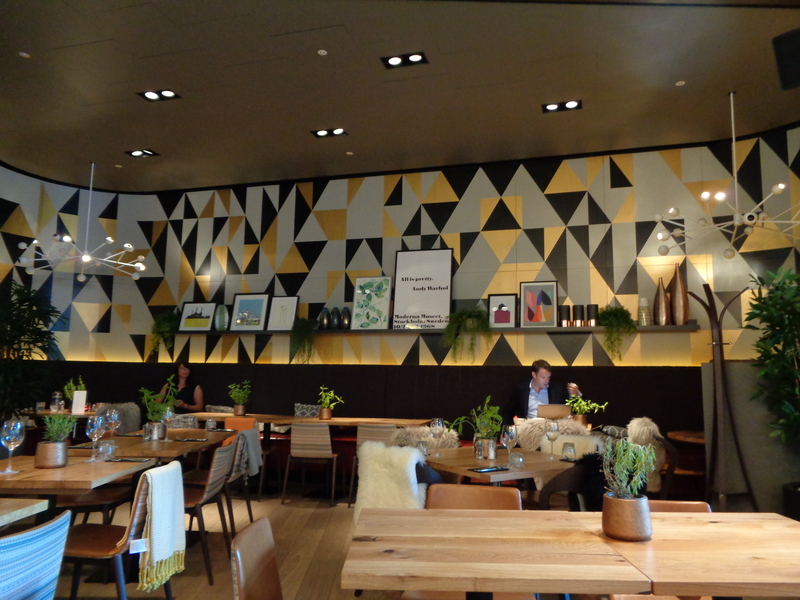 I love the design inside the restaurant and those meals, especially the desserts, looking so tasty! This isn’t far from where I work, so I’ve got to check it out – especially since I always run out of ideas of where to meet for lunch/dinner after work! Lovely interior and decor and the dessert is definitely my favourite! Would try this place next time I travel that side. I love the look of this place, especially the walls and that Knickerbocker Glory looks amazing!! That knicker bocker glory looks amazing. I’d totally love to go there and eat mmmm! 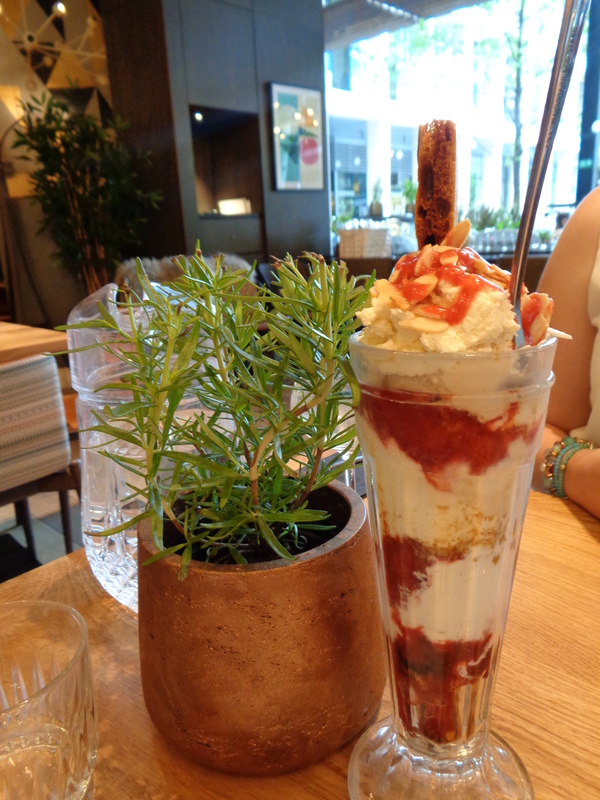 Always judge a place on the desserts – the Knickerbocker Glory looks amazing! Oh my word, I would love that knickerbocker glory! Incredible!